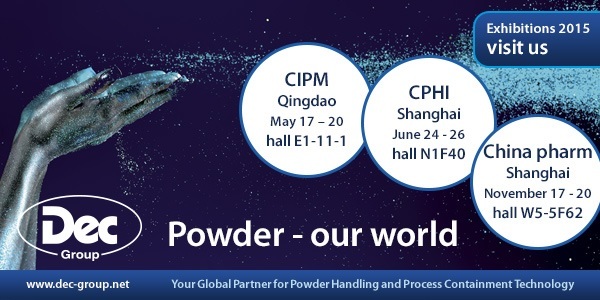 Ecublens, Switzerland: – Leading provider of powder handling systems, the Swiss Dec Group, will underline its growing presence in the Chinese market with high profile presence at some of the country’s leading pharmaceutical industry events over the coming months. Dec will exhibit its innovative and high containment blending, dosing, sampling and filling and emptying solutions based on its patented Powder Transfer System (PTS) technology. Dec recently signalized closer co-operation in China market with industrial solution provider Rieckerman Pharmatech for providing an even more expanded portfolio of solutions for customers. Dec Group’s first 2015 Chinese appearance will be at the four day CIPM Qingdao event, opening May 17. Dec will follow this up by exhibiting at the huge CPhI China expo in Shanghai the following month (June 24 – 26) and later on at China-Pharm (November 17 – 20) in Shanghai. The appearances will be under the name of Dec China, stressing the group’s established presence in the Chinese market following the establishment of a Shanghai-based subsidiary company. “We have seen high interest in our Swiss-made solutions from local pharmaceutical, chemical and fine chemicals manufacturers who need increasingly sophisticated powder handling and isolation systems to deal with more specialized APIs and other ingredients,” he added. Dec Group will also be able to point visitors to the company’s new Chinese language website, due for roll out over the next few weeks. CIPM is one of the largest pharmaceutical machinery industry shows in the world. The bi-annual event has been held for 48 times since 1991. Over its 24-year history, CIPM has made a sizeable contribution to raising the Chinese pharmaceutical industry’s international profile. CIPM has also firmly established itself as the international pharma industry’s must-attend show in China. Attracted by the show’s huge number of domestic visitors, more and more international exhibitors are coming to CIPM. Exhibitor attendance has risen from 14 in 2010 to 103 last year. The event regularly features more than 20 high-level forums and technical seminars. CPhI China brings the highly successful worldwide UBM-organized franchise to one of the world’s biggest single pharma markets, combining five shows in one, with the event also including ICSE (outsourcing solutions), P-MEC (machinery and equipment), InnoPack (pharmaceutical packaging), BioPh (biopharma products) and LabWorld (laboratory, analytical & biotech equipment). CPhI China bills itself as ‘Asia’s number one show in pharma and food industry, with more than 2,500 exhibitors and at least 63,3000 visits over the three days of the 2014 show. CPhI 2015 will also be a three day event, opening June 24 at the SNIEC exhibition center in Shanghai and is expected to attract exhibitors and visitors from more than 100 countries. Click on DEC announces China presence at leading 2015 fairs for more information.